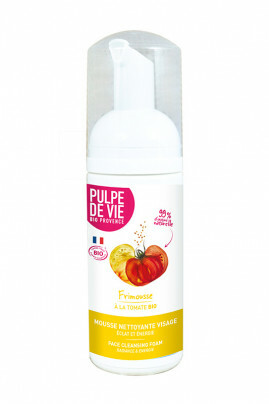 Pulpe de Vie Frimousse is an organic foaming fruity cleanser for the face with a fresh perfume of grapefruit and tomato. I am made with 20% of fresh grapefruit and raspberry, directly bought from local french organic producers, from Corse and south of France. We added to Pulpe de Vie Organic Foam Cleanser some bee balm, well-known for its tonic effect, the glycerin for its calming effect and 2 natural cleansing ingredients. Press the foamer twice to get the right amount of Pulpe de Vie Organic Foam Cleanser, emulsify with some water then rinse. 48% of organic flowers and fruits: 15% of grapefuit water, 5% of raspberry water and 28% of bee balm water. 14% of moisturizing and make-up removers ingredients.